While overbearing Southern genteel mother, Amanda, strives to give her children, Tom and Laura, a life beyond their decrepit St. Louis tenement, she is herself trapped by the memory of her life past-- a life of cotillions and suitors and wealth, now long gone. 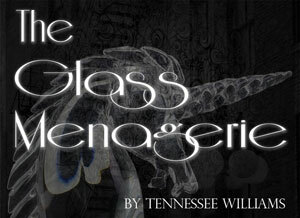 Tom, pressured by his mother to help find the physically disabled and cripplingly shy Laura a suitable husband, invites an acquaintance from his factory job to the apartment, a powerful possibility that pushes Amanda deeper into her obsessions and makes Laura even more vulnerable to shattering like the glass figurine menagerie she treasures. Williams’ intensely personal and brilliantly tender masterpiece exposes the complexity of our memories, and the ways in which we can never truly escape them. Call the Box Office at 409-933-8345 or 1-888-258-8859, ext. 8345. Since 1972, COM Community Theatre has presented over 228 productions including children's theatre, concerts and workshops with attendance of more than a quarter of a million people. The theatre has been recognized as one of America's leading community theatres, setting high production standards and developing one of this country's most innovative programs. Beyond education, the College of the Mainland Theatre bears a three-fold commitment: to provide quality theatrical experiences for residents of the area, to offer a forum for local and regional talent by holding open auditions and to extend the reputation of College of the Mainland.